Automotix is working with Affirm to offer financing to our buyers in a quick and streamlined manner that is fully transparent. This service has no hidden fees or costs—the full amount you owe is presented to you up front before your checkout. Select from 3, 6, or 12 months of fixed payments to pay off the price of your auto part based on your personal budget. For a $2,000 engine the monthly payment will be $353.05/month, at 20% APR for 6 months—making the total $2,118.30. Down payment may be required. 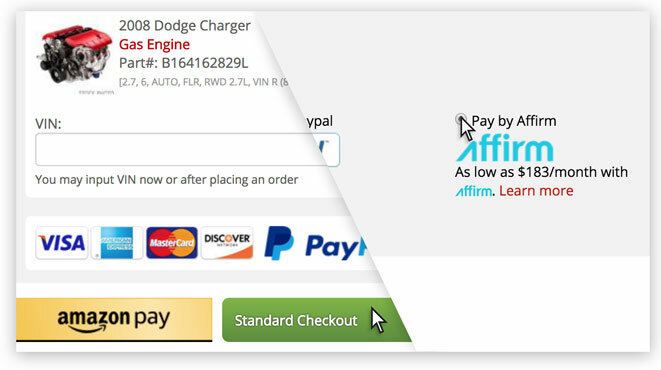 Automotix is working with Affirm to offer financing to our buyers in a quick and streamlined manner that is fully transparent. This service has no hidden fees or costs—the full amount you owe is presented to you up front before your checkout. Select from 3, 6, or 12 months of fixed payments to pay off the price of your auto part based on your personal budget. Your loan approval process is verified in less than minute. Applying for Affirm financing is quick and easy. Simply provide a few details about yourself and get a real-time decision so you can get started on your financed purchase now and pay for this product over an extended duration. All your personal information is fully guaranteed to be secure and confidential. Applying for a loan with Affirm will not affect your credit score, as they only use a soft credit check. 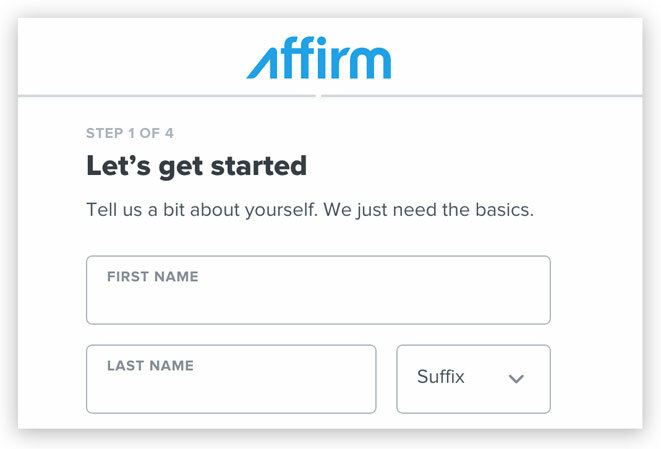 Anyone can apply for finance through Affirm and we also offer a Pre-Qualification feature to quickly verify the financed amount. Making on time payments with Affirm will help you build up positive credit history. With Affirm you will see exactly what you owe up front, with no hidden costs and no financial surprises. You will see the loan terms, including your APR and your monthly payment amounts, before you decide on a payment plan. As part or our partnership, Affirm will notify you of any up and coming payments via SMS or email that you provide. Affirm also offers a dedicated customer service team for any questions if they arise. Confirm your item in the Cart. Checkout per usual via “Standard Checkout”. This will take you to the Affirm’s Application Form. Insert your information to Affirm to get a quick real-time credit decision. If approved, you will be notified quickly. Then select from a 3, 6 or 12-month financing plan with rates from 10-30% APR. For a $1,000 transmission the monthly payment will be $176.52/month, at 20% APR for 6 months—making the total $1,059.44. Down payment may be required. Financing with Affirm is fully transparent in that you will see the interest rate, the total interest you will pay, the approved loan amount and the number of months you have to pay off your loan. All this information will be provided to you the buyer before you complete the order. 3. Finish The Order & Get Your Part! Affirm at this stage has provided the full funds available for your purchase. Nothing more to do on your end. Your order will be completed at checkout and your order will be in route to being shipped. Affirm payment subject to credit check and approval. Down payment may be required. Rates from 10-30% APR. For purchases under $100, limited payment options are available. Affirm loans are made by Cross River Bank, a New Jersey State Chartered Commercial Bank, Member FDIC. See www.affirm.com/faqs for details.